The Pediatric Rehabilitation Center offers a comprehensive range of physical treatment and rehabilitation services for children. When treating the physical symptoms of a condition, psychological well being must also be considered. At the Pediatric Rehabilitation Center, the services are delivered by a team of medical professionals specializing in physical therapy, occupational therapy, hydro therapy, psychotherapy and speech therapy. All of our specialists have been trained by leading institutions in Thailand and overseas in keeping with Samitivej standards. Children are not small adults. Therefore, their medication, treatment and rehabilitation are different. The Pediatric Rehabilitation Center at Samitivej Children’s Hospital understands the importance of providing pediatric services exclusively by pediatric specialists. As such, to provide appropriate treatment plans, our treatment programs are planned together with the family. These treatments include physical rehabilitation programs for both physical and psychological health for special needs children, including those with Down’s Syndrome, developmental delay, autism, cerebral palsy, limb disabilities, structural disabilities, such as scoliosis, and deformed joints in the hip, knee or foot. The Center also regularly holds meetings where our medical team of physicians, physical therapists and occupational therapists for children meet with the children’s parents in order to plan the treatment together. The treatment can vary greatly from child to child based on individual needs from the array of specialties. 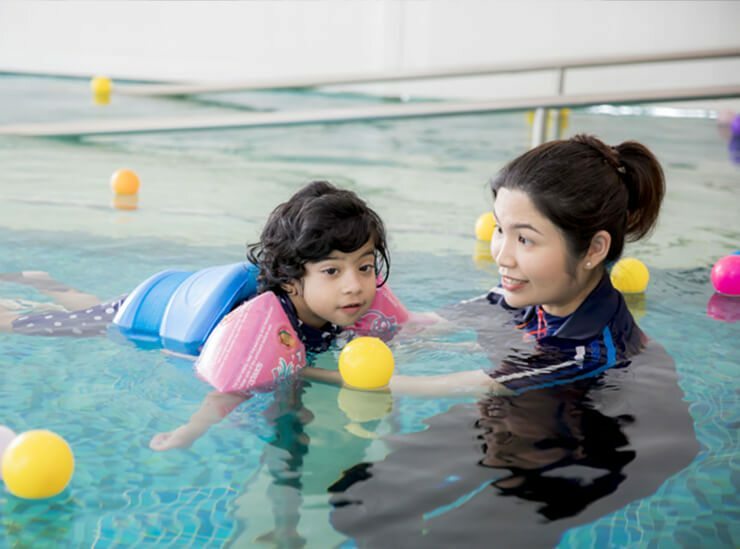 Individualized and private therapy can include the water exercise for children, under the close guidance and supervision of a personal physical therapist. For children with autism, a team of rehabilitation specialists utilizes Sensory Integration Therapy and the Snoezelen® technique to improve concentration and stimulate learning development.